The scales available for selection are added to a list of "Active Scales". Select Scales... from the rightmost menu in the transport area at the bottom of the main display. 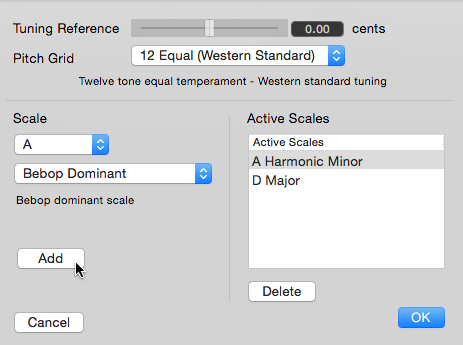 Select the scale and base key that you want to add to the list of Active Scales from the drop down menus on the left of the displayed dialog, and click Add. The new scale will be included in the list on the right. Scales and base keys are stored with Pitch Grids, so if you change the pitch grid you will only see the active scales that were added for that grid. More than one scale can be added to the range of available options in the previous section, and the displayed pitch grid can be toggled between these scales and "all notes" using the + and – keys on the computer keypad, or by using the menu in the transport area that was used to open the Scales window earlier.